Diet Fix says that despite the 1000’s of success stories, 90% of all weight loss plans don’t produce long-term results. The creator of Diet Fix, Dr. Yoni Freedhoff, claims the reason is because most diets are unrealistic, unhealthy, and nearly impossible to follow. Giving up an entire food group. Using your willpower to fight hunger. In The Diet Fix, Freedhoff says that not only is this approach not necessary, it is sabotaging our ability to lose weight. The Diet Fix is step-by-step guide to long-term weight management that debunks common myths about dieting. Most dieters have the idea that suffering to some degree is a necessary evil to be successful at losing weight. Diet Fix calls these ideas “Dieting’s Seven Deadly Sins” and provides evidence that these concepts are flawed. Hunger: Ultimately if your diet includes regular battles with hunger it is only a matter of time before you end up giving in. Sacrifice: There is little likelihood that you will be willing to live a life of perpetual sacrifice forever. Willpower: Dieting theory suggests that we should be able to will ourselves to resist temptation. But if your needs are not being met, eventually you’ll give in. Perfectionism: Many people cling to the idea of dieting perfection. When they cheat they believe the entire day is ruined so they may as well indulge completely. Diet Fix shows readers how to replace this toxic dieting mindset with positive beliefs and behaviors. It offers a practical plan to help dieters begin living happily while permanently losing weight. Learn to control food rather than letting it control you. Shut down your most powerful cravings. Learn how to indulge in previously forbidden foods. Break free of the mindset of traumatic dieting. Each day you will focus on developing a new practical skill. By the end of day ten you will have embraced a new way of behaving and thinking about food. Eggs, tuna, chicken, lean turkey, low-fat Greek yogurt, low-fat cheese, skim milk, whey isolate protein powder, natural peanut butter, textured vegetable protein, tofu, soy flour, oatmeal, quinoa, whole wheat pasta, berries, apples, banana, avocado, Swiss chard, tomato, mushroom, cauliflower, canola oil, chocolate. Some dieters equate success on their program with adhering to an extreme exercise regime. But excessive strenuous exercise will eventually cause someone to give it up, whether because of exhaustion, injury or boredom. When this happens it can produce feeling of failure that causes them to give up on their diet as well. Instead Diet Fix says it is better to exercise just as much as you can enjoy doing each day. Exercise is a crucial part of weight loss success. However you don’t need to spend hours at the gym to get results. 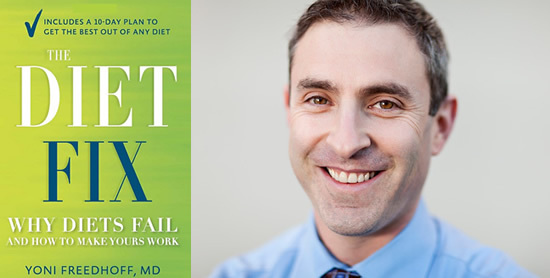 The Diet Fix: Why Diets Fail and How to Make Yours Work retails at $25.99. Diet Fix dispels many common myths about dieting and weight loss. Encourages a flexible approach to healthy eating. Will help dieters recover from the trauma of restrictive dieting. Includes recipes for main meals and snacks. Can be used in conjunction with whichever diet you prefer. Diet Fix requires calorie counting, which seems contradictory to the message of the book. Encourages the use of artificial sweeteners and processed soy products. Weight loss may occur more slowly than on other diet plans. The Diet Fix outlines a program for letting go of negative thought patterns and behaviors that sabotage weight loss efforts. If you are tired of struggling to lose weight just to gain it back again, this plan offers relief. By following the suggestions in Diet Fix you will adopt a new approach that supports sustainable weight management for a lifetime.